Children aged 3+ with very little or no skating experience may register in the Precanskate program which offers 30 minute group lessons with a focus on learning how to stand up, fall down, push and glide. Skaters who have completed Stage 1 of the Canskate program may register in the Prepowerskate program which offers 30 minute group lessons with a focus on improving essential skills required for hockey including balance, forward/backward skating, stopping, turning, agility and endurance. Designed for the budding hockey player. 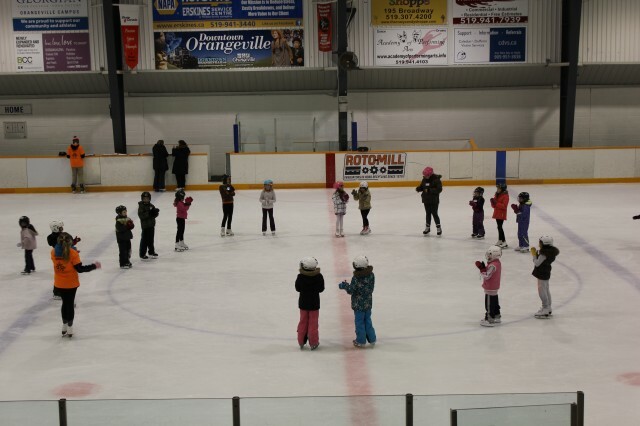 Children who are interested in learning to skate and have completed a Precanskate program or have some basic skating skills may register in the Canskate 1-2 program which focuses on fundamental skills such as stopping, turning, backwards skating while encouraging fun and movement on the ice. Children who have completed the Canskate 1-2 program may register in the Canskate 3-5 program which continues to focus on fundamental skills with a higher degree of difficulty. Skaters who have completed Stage 5 of the Canskate program or on the recommendation of a Skate Canada coach may register in the PreStar program. New skaters to our club who are already participating in the Starskate program may register in the Star 1-2 or Star 3+ programs.